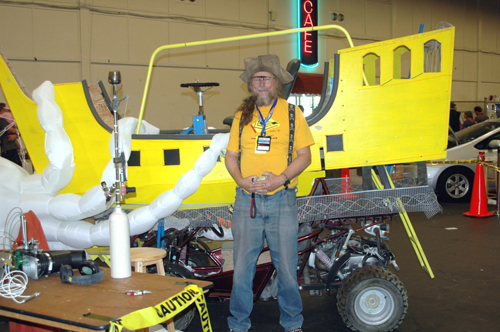 The big events this month were Makers Faire where I was asked to bring my art car "Short John Silver", followed by some prep work for Burning Man. I made a few shop mods to improve storage, one minor and one major. 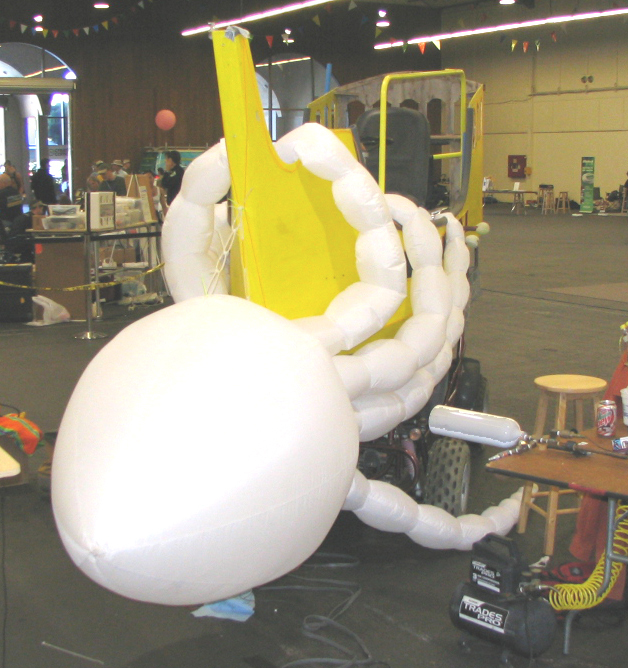 Photo #1: Here's the beastie, complete with captain me, on display at Makers Faire '07. Photo #2: Bow shot of Short John Silver showing off my rather unique cow catcher, aka Squidly, which was built by my pal Inflatabill..
No shop is ever tidy enough and mine had gotten far from ideal. 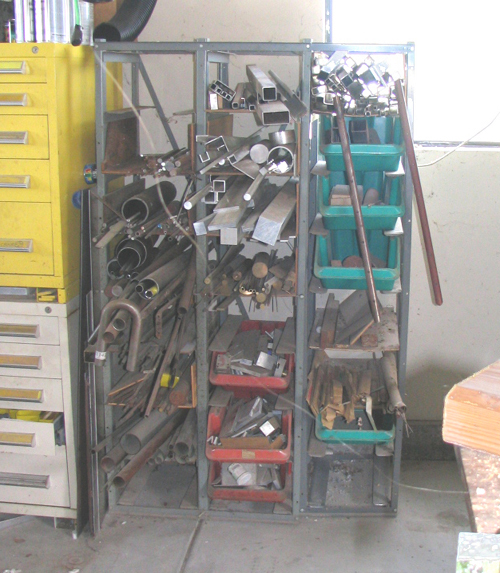 Storage of components for the lathe had gotten to the point where one shelf was no longer adequate. 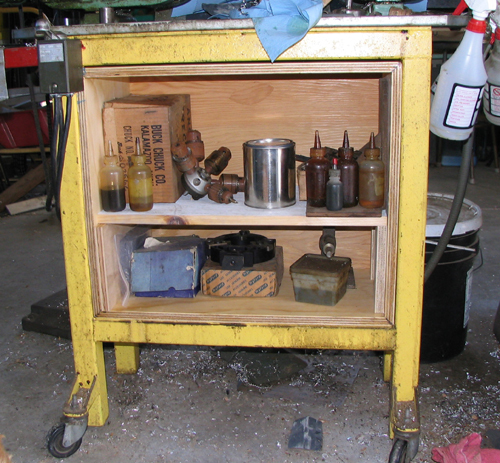 I've added a turret and a collet closer and when they're not needed for production there's no place to put them. 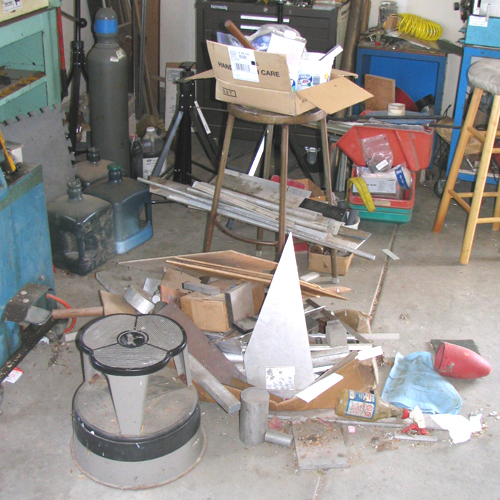 Photo #2: For decades I'd been making do with this set of rickety shelves to contain my inventory of metal bits. Shelves were only 18" deep which was another limit..
Photo #3: ...But time has taken its toll and the overflow was getting pretty bad! 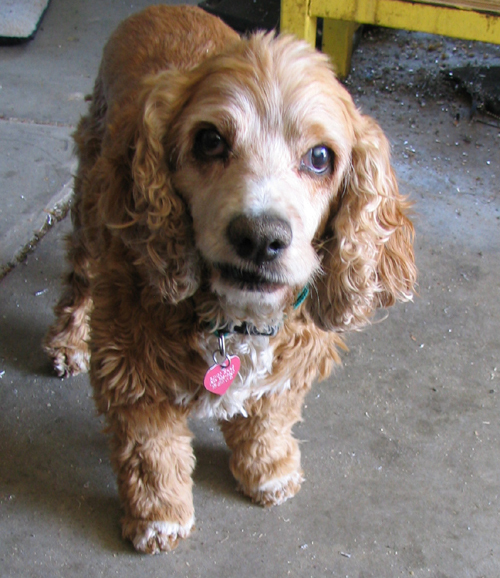 Photo #4: I was getting numerous harrumphs from Sandy Bear, my faithful shop doggie, as there wasn't room for his pillow any more! 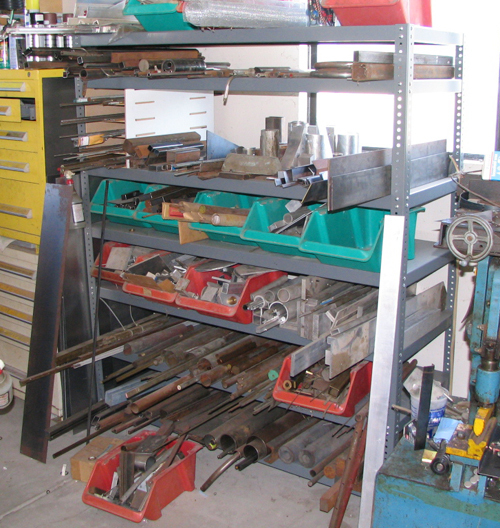 Photo #4: So I bit the bullet and spent more than a few days reorganizing inventory. I figure I moved more than a ton of stuff off of the old shelves and off of the floor, the countertops, from under stools, etc and put all and sundry on a new shelf system that was 6" deeper and rated for the load. Now it's much improved! Still a few more things to cram onto the shelves but the floor clutter is gone and the wigglers are happy.